Chronically Vintage: An appreciation of the classic 1945 British film "I Know Where I'm Going"
An appreciation of the classic 1945 British film "I Know Where I'm Going"
Dear Readers, my name is Elizabeth Pritchett (some of you may know me from my vintage fashion and beauty blog, Gloriously Vintage) and I am so thrilled to be writing a guest post on Chronically Vintage. When Jessica invited me to do so while she’s on holiday to Edmonton, I said "yes" straight away. My first thought was to write about another aspect of my vintage life (so far I've mostly covered fashion and beauty related topics on my blog, which I launched a few months ago now) which is my love of classic film. So welcome then to today's post on just that. Do you watch "old" or "classic" films? Do you collect DVD's of great films? I really enjoy blogs that feature wonderful films from the 1930s- 1960s. My own taste spans from 1930s to modern days. I like silent films too, but love to hear the stars talking! The Hollywood musicals are also firm favourites. I like nothing more than settling down with a hot drink and a great film. It is a marvellous way to relax, step out of one's busy life, and be swept away by the story. Films from the 1940s are interesting, too, because of the authentic fashions, social conventions, and as a window into a time when life was extremely challenging because of world events. I discovered this film a few years ago and it is now a firm favourite. At our house, we receive the "Radio Times" every week. This long running publication records the weeks TV and Radio programmes. Selected films that will be shown that week are also reviewed. In it one finds wonderful writings from a talented film critic called Barry Norman, who is very knowledgeable about all film genres. He reviewed this film in the RT and wrote about it in such glowing terms that I wanted to see it. In the publication, this movie was given 5 white stars, the highest accolade, and Barry Norman has ranked this film in his top 100 films of all time as well. Once I viewed it, I wanted my own copy so I could watch it again (and repeat the experience!). This movie was written, produced and directed by Michael Powell (1905 - 1990) and Emeric Pressburger (1902 -1988). The pair also made A matter of Life and Death (1946) and The Red Shoes (1948), and it was their fourth collaboration. They called themselves The Archers and referred to the film as IKWIG. It was made in 1945 in black and white, because, at the time, all of the colour film had been requisitioned by the Air Force for training films. The screenplay was written in six days, developed from an idea that Powell and Pressburger had been thinking about for some time before then. 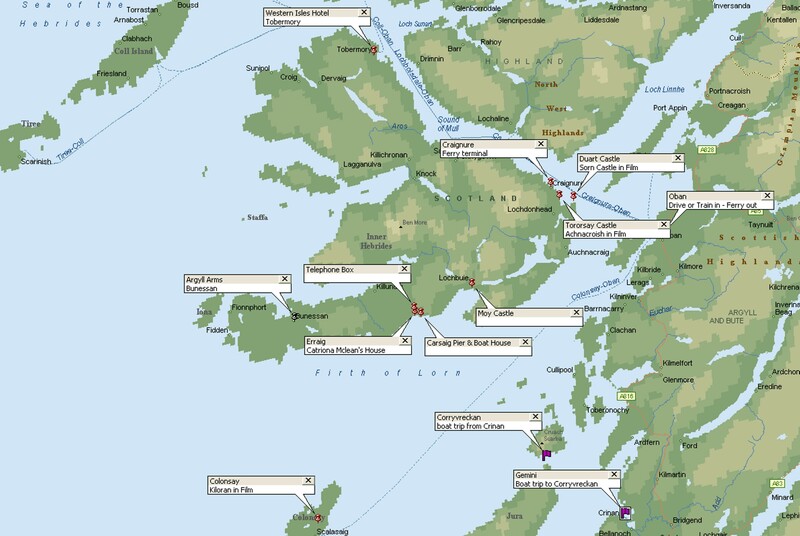 This film is a romantic love story with most of the film set in the Western Isles of Scotland. There is a legend, a curse, and a number of romantic castles and a phone box next to a waterfall (that makes hearing the phone call impossible!). The thrust of the story is that the twenty five-year old heroine, Joan Webster, is travelling from Manchester to the Isle of Kiloran to marry a rich industrialist, Sir Robert Bellinger, who is old enough to be her father and is the local Laird (a Scottish estate owner). In doing so, she will become Lady Bellinger, having the materially rich life she has chosen for herself. She is sure that having money is the key to her future happiness. Joan is so single minded in her pursuit of this goal that when she is forced to wait on the Isle of Mull because of a storm, she risks her life and the lives of others, too, by trying to reach Kiloran in a small boat. 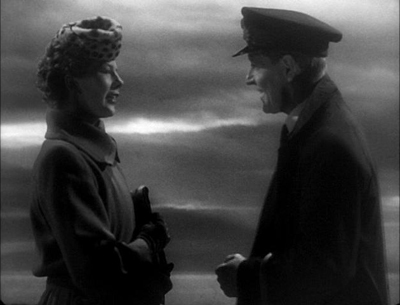 In the process of such, Joan meets a young naval officer, Torquil MacNeil, who is also trying to reach Kiloran on an eight day long shore leave. They are compelled to wait on Mull. She learns that Torquil is in fact the true Laird of Kiloran and that her fiancé is renting the title, from him. They start to fall in love with each other, as MacNeil of Kiloran is a gentle and patient man who is at ease in his environment, as well as being both wise and calm. Joan is a city girl whose desperate to get to Kiloran, but she is challenged by her time with MacNeil and struggles to see that the life she thinks she wants could be so limited and empty without true love. My favourite quote from the film, is where MacNeil points out a big difference to Joan. It struck me on first viewing and catches me every time I see the film. The two leading characters are played by Wendy Hiller (1912 -2003) and Roger Livesey (1906 -1976). Their performances are strong and so engaging. I found Joan rather unlikeable, but Wendy Hiller showed her struggles so powerfully that I warmed to her as the story unfolded. Roger Livesey as MacNeil of Kiloran was handsome, charming and wise - I think I fell a little in love with him too! He looked dashing in his naval uniform and so at home in his kilt! At the start of her journey, Joan appears in the most wonderful suit. It has a slightly A-line skirt that reaches to just below the knee couple with a hip length jacket, and is beautifully tailored to fit her figure perfectly. She also wears the most glamorous tilt hat in leopard print and has a matching large envelope clutch bag. On her left lapel, one finds a big brooch as her only jewellery apart from the enormous diamond ring that shows she is engaged to "one of the richest men in Britain". Over her suit and simple top, Joan has a wool overcoat that is waisted with a fuller skirt. The coat and skirt lengths are just right together and of course the hat and matching bag look fantastic, too. During the film she has super pyjamas and a very 1940s housecoat with stripped lapels and, naturally, a tie belt. Her travelling clothes are understated and so elegant. Joan is excited and so assured that she has her life mapped out. Her clothes are expensive - probably all paid for by Sir Robert Bellinger who had contacts to get round clothing coupons and rationing. This film has inspired me, lovely readers, to try a matching hat and muff, as well as a leopard print collar and matching muff to wear with my A/W suits. I am looking forward to bringing them out later this year at the end of September. I hope you will enjoy this film as much as I have. When I watch it again, I'm going to keep my eye on Roger Livesey, as, quite fascinatingly, he was actually in a stage play in London at the time of filming and thus never went to Scotland! It has been such a pleasure to write this post about "I Know Where I'm Going", a favourite film of mine. I am hoping to share more wonderful classic films on Gloriously Vintage with you as time goes on, so be sure to visit me there to see future reviews. And thank you again to Jessica for this lovely guest post opportunity. I loved that film too! I seem to remember some innovative effects including tartan mountains (!) and a realistic-looking whirlpool. I re-watched it recently on the sleeper train to Fort William on my way to Skye and the Western Isles - really got me in the mood, particularly for the torrential rain I had for the first five days! A lovely film. I don't think I'd ever heard of that film, though I'm all about classic films. Silent cinema is my passion (having seen 1,114 to date), though I also love the early sound era. This year, since finally reaching my long-awaited goal of 1,000 silents, I've been getting more into early sound films that aren't comedies, since I knew that was a big gap. One of the local indie theatres, about a mile up the road from me, shows classics every weekend, and charges only 35 cents for their Sunday matinée showing. They also show classics at other times, though it's mostly on weekends. I do enjoy watching a lot of old films, generally from the 30's, 40's, and 50's. I do like hearing about new movies that I have never heard of, and that don't make the "classics" list. I like watching classic films, but I haven't seen this one. It sounds fantastic! I have never heard of this film before, but it sounds just lovely! Thanks for the great review- now I'll have to see if I can find it to watch too. Thanks very much for this post. I did not even know this film existed. I have never heard of this film, thanks for the introduction! I love watching classic films! This is definitely one I've never heard of before. I will have to check it out :) Thank you for the glowing recommendation. I've never seen this film, but I will definitely search it out. Vintage love stories are the best. ;-) I love musicals from the 30s-50s, but I don't mind the occasional drama, too! Dear Elizabeth, What a lovely surprise to see your guest post! I do enjoy old movies. I haven't seen this one. Castles, a phone box by a waterfall, Scotland, animal print hat and clutch (maybe it's cheetah? ), travel by train and Wendy Hiller...I want to see this movie!!! I found out that Petula Clark plays the young girl. Oh I love this film, so glad that others have an appreciation for it. Funny, sweet and incredibly romantic. One of those film that would cause me drop everything if it happened to be on the classic movie channel. I hadn't heard of this movie until I stumbled on it in the TV guide too! Here it was on at 2am but I often recorded the late night classic movies to check them out. I agree with your feelings about Joan and I didn't fall for MacNeil right away but his accent won me over soon enough. Like you though I fell for that leopard hat quickly! I'd like to make something similar soon and I look forward to seeing your leopard outfit. Huge thanks to each of your for your wonderfully nice comments on this guest post. I - as I know Elizabeth does, too - really appreciate them. Would you guys believe it, I myself have not yet seen this classic British film. After reading Elizabeth's engaging review, I definitely want to asap though and will be trying to track down a copy on this side of the pond. Thank you again for making Elizabeth feel so welcome here as a guest blogger. You, my dear readers, absolutely rock! This sounds like an interesting feel, I shall have to try to find it. The costumes sound wonderful too. Doesn't it though? Elizabeth's thorough and engaging review has made me yearn to see this classic British film, too. I've been hunting around for a copy on this side of the pond as of late, but haven't found one. Hopefully I will sooner or later. I often wish that there was a service, much like, Netflix just for classic movies from around the world (Netflix has some itself, of course, but not an overly big library, IMO). What an amazing joy that would be for yesteryear film fans everywhere! I know what you mean. I always think that I will find classic films on Netflix and I don't think that they have that many. They are missing a trick there! !